The Punching Bag: Against "Displacement": A Thought about Hilgert's "Culture Matters"
In "Why Culture Matters," Markus Hilgert asserts that the importance of culture lies in its "fostering identity through cultural heritage" (as the article's title after the colon puts it), and defines the key problems facing culture as those of the destruction and displacement of heritage. Culture, heritage, identity -- these terms are almost intolerably contaminated by received ideas and begged questions, so much so that any effort to say something intelligible about their relationship in a column is bound to fall short. But what I find more troubling in Hilgert's argument is his discussion of displacement. The term "displacement" is problematic, because as Hilgert uses it it obscures the distinction between the looting of archaeological sites and the illicit export of artifacts. 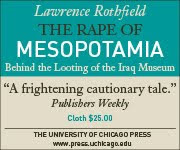 Archaeological site looting destroys the archaeological context needed to study the past objectively and provide the facts grounding the historical truth about the past; illicit export of artifacts injures national pride (in ways that may, by the way, paradoxically strengthen a sense of aggrieved national identity, with consequences that the last century's history shows can be murderous). While heritage and identity need to be cared for, we cannot care for them properly without a primary commitment to truth, rather than to heritage or identity per se. And that means that policies should pay at least as much attention to the need to secure archaeological sites from looting as they pay to iconoclasm, conservation and repatriation of displaced artifacts, and heritage development.